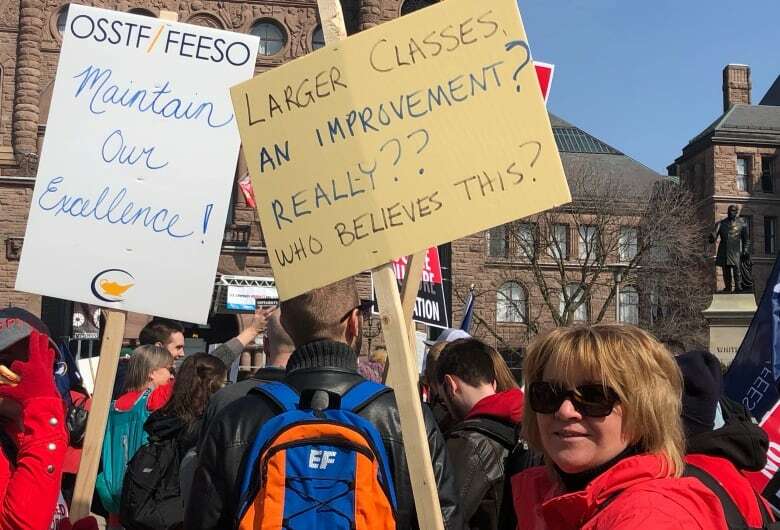 Thousands of educators from across Ontario descended on Queen’s Park on Saturday to protest impending changes to the province’s education system. The rally was organized by members from five different teachers’ unions. Demonstrators, some from as far away as Sudbury, Ont., arrived to Toronto in more than 150 buses. “We want to make sure that our voices are heard. We want to make sure students know that we are fighting for them and that we care about them,” said Kristen Smyth, who teaches high school drama and ESL in Kitchener, Ont. The protest comes in the wake of the provincial government’s decision to increase average required class sizes in intermediate and high school grades, introduce mandatory e-learning modules and cut at least 3,475 full-time teaching positions, it says through attrition. School boards have warned the revisions could lead to classes with up to 40 students and result in various electives being cancelled altogether. The fallout could be compounded by an overhaul to Ontario’s autism program, which will likely see schools trying to cope with a sudden infusion of students with challenging needs. On Thursday, tens of thousands of students at some 600 schools across the province staged a walkout to protest the coming changes. Marissa White, who teaches art to high school students in Kitchener, says that because many of her courses are electives, she will likely be directly affected by the government’s revamps. “I honestly do not understand how anyone can read about what’s happening and think that it’s a good idea,” she told CBC News from the sprawling lawn at Queen’s Park. White said her classes currently have about 33 students. Bigger class sizes will make her daily tasks nearly unmanageable, she says. “There’s not physically enough room. Classrooms weren’t built for that many kids. Thinking about how I’m going to do tracking and manage my students, there’s no way one person can handle all of that,” she continued. Smyth said that more students and mandated e-learning courses will be particularly difficult for students still learning to speak English. “I won’t be able to have as much time with each student as I would like, to make sure that they are growing, make sure that they are understanding,” she says. Despite considerable pushback from educators and students, the Progressive Conservative government says it has no intention of revisiting its policy plans ahead of a new round of collective bargaining negotiations this fall. In a statement Friday, Education Minister Lisa Thompson said the government would not be “distracted by union tactics” such as protests and rallies. “The fact is that Ontario’s teacher unions have been handed control of the education system for the past 15 years,” Thompson said. The Ministry of Education says the five-year high school graduation rate was 86.3 per cent in 2017, up from 70 per cent in 2004, and the four-year graduation rate was 79.8 per cent, up from 56 per cent. Math scores for high school students held steady in 2017 compared to 2006, but have declined in elementary school.